Shoreline Fruit announced today the donations of both gifts and dollars valued at over $2,100.00 to local families and non-profit organizations in the Greater Grand Traverse Region over the last 12 months through employee directed fund raising events. 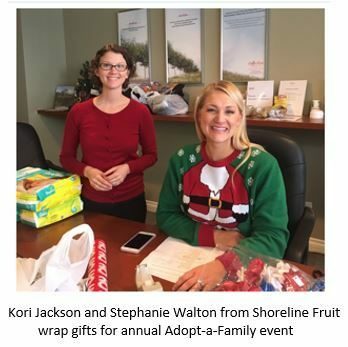 "Working together with our Shoreline Employee Reward and Recognition Committee, our work force has held various internal fund raising events to help provide needed dollars and holiday gifts to families and organizations in our community. We feel very good about our employees’ willingness to give back to the community that helps to support our company" said Charlene Bowen, Shoreline Fruit’s Director of Human Resources and Organizational Development. 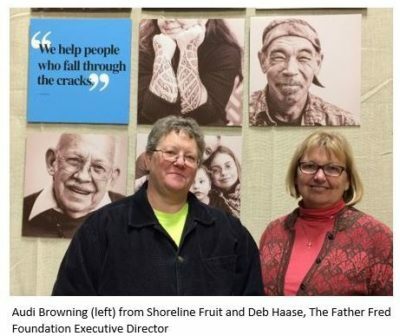 Shoreline Fruit employees have personally bought gifts and provided dollars for adopted families during the holidays and raised dollars to help support The Woman’s Resource Center, The Father Fred Foundation, and most recently made a donation to the Mid-Michigan Honor Flight.